Walk down the line at most 1000-yard benchrest matches, and you’ll see plenty of rifles costing upwards of $3000–and that’s without scope. Here’s a gun that came complete from the gunsmith, ready to shoot, for less than half that price (less optics and fancy paint). That even included a fitted muzzle brake. And this Savage shoots as good as it looks. 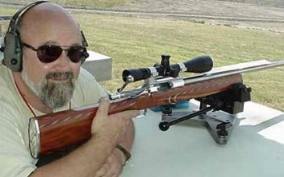 In May, Gerry Nordmann shot a sub-10″ 44 score at 1000 yards with his handsome “Badlands” rig, a darn impressive showing for Gerry’s first-ever 1K benchrest competition. And “Badlands” is not just a flashy “race-gun”–this 6.5-284 does double-duty as a long-range prairie-dog slayer. When Gerry Nordmann emailed us a photo of “Badlands” it was hard to believe this was a Savage. Plain Jane it’s not. Gerry explained: “I’m a fan of Savage actions, and I see no reason why they can’t perform at a very high level with the right components, assembled by a good smith. I commissioned Fred Moreo of SharpShooter Supply to build this rifle. He supplied the bare single-shot action and everything else from recoil pad to muzzle brake. 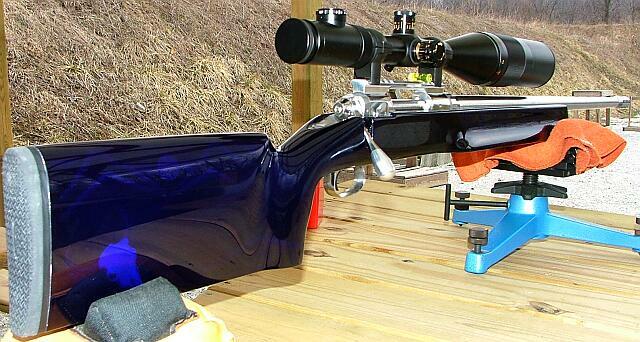 The stock is Fred’s Long-Range Benchrest model, (Tooley style), glass-bedded by Fred, and painted by Zac Ingram. The highly-polished action secures a 27″ 1:8″ twist Douglas barrel tipped with a medium diameter SSS muzzle brake. ‘Badlands’ is chambered in 6.5-284 with a no-turn .297” neck. The action has been fully trued and re-timed, with a reverse baffle washer and a SSS Benchrest Trigger set at 12 ounces. Other features are a competition heavy recoil lug, and an oversize tear-drop bolt handle. A NightForce 12-42×56 BR scope (B2 reticle) rides in Burris Signature Zee rings on top of a +20 MOA Farrell base. Call it extravagant, but I wanted this rifle to look really special. The paint job ended up costing more than the action, by quite a bit. But Zac Ingram did a spectacular job, and I really enjoyed working with him on the stock design. I wanted something with: A) The Badlands; B) The Old West; and C) The Sturgis Motorcycle feeling. 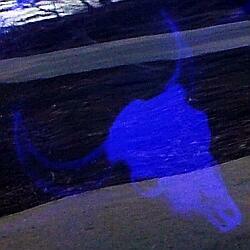 You’ll notice a buffalo skull on the rear of the stock. Native Americans believe a buffalo skull brings luck (which any shooter needs), and decorated buffalo skulls are popular South Dakota folk art. The Badlands, which I found very interesting, are shown in the moonlight, painted in the dark candy colors that are popular on custom motorcycles. And, the lettering on the fore-end was done with an Old West-style font. The paintwork took over two and a half months because of Zac’s other work and an injury he suffered. There were quite a few bumps in the road when it came to producing ammo for my new 6.5-284. To start off, I tried to order 500 Lapua 6.5-284 cases in December, 2004 but they were out of stock. If you had been following Benchrest Central you probably heard about the customs problems Lapua was having. At the end of February the suppliers still had not received any Lapua, so I purchased whatever 6.5-284 brass I could find, namely Hornady. I needed at least 50 pieces to start load development. It seemed like a good idea at the time. However, that purchase, along with an unforeseen problem with my old Dillon Electronic scale, caused a lot of unexpected stress. It was already early March, and I was ready start. I had decided on H4350, so I loaded what I thought to be some mid-range starting loads: 46.5, 47.0, and 47.5 grains. Sounds reasonable, right? Well I had big pressure problems with the first round fired! Being the clever fellow that I am, I suspected something wasn’t quite right when I had to use a rubber mallet to open the bolt. Upon calling Hornady to inquire if they had received any complaints about this new brass, the Tech Rep replied in the affirmative. He also said that they were already sending out a harder version to suppliers. However, I am still stuck with 50 pieces of mush brass, and a need to shoot my new gun. So, I loaded four cases with 45 grains of H4350 and went to the range, only to experience the same bad results. The next day in a conversation with my friend, Ed Nazy, he suggested I check my powder scale. Since I hadn’t checked the calibration for a long time. I discovered that my Dillon scale was reading two full grains low! This meant that my ‘moderate loads’ were actually quite warm. Add to this the soft brass and it is quite understandable why my bolt was sticking. And now I knew that I needed a new scale. Fortunately, 6mmBR.com came to my rescue with a timely review of the RCBS ChargeMaster Combo, and even found me the best price around at MidSouth Shooters Supply ($259.99). This is quite a bit cheaper than the $309.00 price I saw in another catalog. So I now have a fancy new machine to load with. I was still depressed about the soft brass and the scale problem, when the Lapua Brass arrived. Praise the Lord and UPS! I now calibrate the scale, with the check-weights, every time I use it–like a clever fellow should. Starting another ladder with H4350 and the beautiful new Lapua Brass, I loaded some at 47.0, 47.5, 48.0, and 48.5 grains. Bullets are Sierra 142gr Match-Kings, the only bullet I am planning on using at this time. I went to the local 100-yard range to break-in the barrel and chronograph these loads. I then repeated the process with 48.5, 49.0, and some 49.5 grain loads. Thank goodness, the rubber mallet was never needed for the Lapua brass. However, the bolt did get a little sticky on one or two of the 49.5 grain cartridges, and the primers were showing some signs of physical abuse. So, I decided on a 48.5 grain load, with bullets seated about .020″ from the lands. This produced a ten-shot 0.538″ group at 100 yards. This load also gave me an average of 2,950 fps velocity–what I wanted for my long-range varminting. It turned out to be a pretty good load for 1000-yard competition as well. I knew I would have to “pre-load” quite a bit of up elevation into the rig to be able to zero at 1000. The Burris Signature Zee Rings worked out very well. With the Farrell 20 MOA base already on the rifle the Burris ring inserts allowed me to add another 10 MOA, to give me a total of 30 MOA. In addition, I can use the inserts to cancel out the 20 MOA in the base if I want to shoot under 500 yards. After getting trajectory data from the free JBM site, I was able to go to local club with a 100-yard range to sight in the rifle for 1,000 yards. I took a four-foot piece of cardboard and marked an aim point at the bottom, then measured up 30″ to where the bullet strike should be at 100 yards if zeroed for 1,000 yards, and marked my point of impact (POI). Within five shots I had the rifle sighted in for 1,000. And, as it turned out, my first Iowa 1,000-yard sighter shots were within six feet of the clay birds used for sighting in. At 1K it’s very difficult to find your POI, unless you can kick up some dust and be able to see it in the small field of view you have with your scope. So I was glad I’d worked this out ahead of time. With “Badlands”, I shot a 9.566″ group (44 score) at my first 1,000-yard match, held May 21, 2005 by the Iowa 1000-Yard BR Association. I was lucky–conditions held long enough for me to get off five rounds before the wind switched. If you don’t get all five rounds on paper you will get “000”. On the way to the Match I only hoped to get all my shots on paper. I was really amazed that I did so well. I guess that Buffalo Skull works.Tim North of Broughton Rifle Barrels (photo below left), one of the top 1,000-yard shooters in the country, heard that this was my first 1,000-yard match and was kind enough to explain the course of fire and 1K shooting strategy to me. Thanks Tim, I owe you one! Because of the ever-changing conditions during the six minutes sight-in time you have before the ten-minute score shoot you have to keep firing sighters and dialing in your scope. You try to time it so that your last sighter and scope correction are made within the 30 seconds before the cease-fire order is given. You open your bolt at the cease-fire and have five rounds ready to shoot as fast as you can when the order is given to commence firing. When that order is given you fire as fast as you can at the center of the target hoping that the conditions haven’t changed since your last scope adjustment. You are pretty much firing blind because you can’t see any bullet-holes with the scope. You are allowed ten minutes for the score shoot, but I believe everyone finished in under 60 seconds. The Iowa 1,000-yard Shoot was not in my plans until a few weeks before my annual Prairie Dog trip departure date of May 20th. Ed Nazy and I were just going for dogs in South Dakota when I noticed that the Iowa Shoot was on May 21st and was not out of our way. I’d been thinking about shooting a 1,000-yard match for a long time, but I didn’t feel I could do it until I had this new 6.5-284 in my hot, sweaty hands. I have been doing some 100 yd / 200 yd BR shooting at the Walbash, Indiana club matches for a two or three years so I thought, since the timing was so good, we should at least stop by to see what it was like. Ed could only observe because a 22BR was the biggest gun he had for this trip. As things turned out I enjoyed the Iowa Club Shoot so much that I joined the Club. 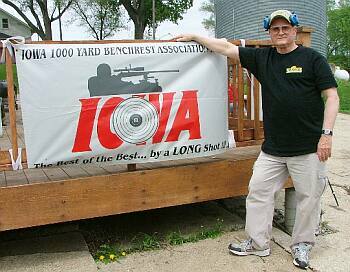 By the way, the Iowa Club has a 30″ gong set at one mile, out beyond the 1K targets. I tried to hit it about 10 times but I couldn’t see my POI and I was just holding high and guessing. I guess I’m going to have to do some home-work, before I go again, if I am ever going to hit that gong. My ballistics table says I need 95 moa to get there–that means serious holdover, or I’ll have to modify my scope set-up. If any of you “Milers” out there have an elegant solution, let me know. I can get +40 MOA with the angled base and Burris inserts, but I think that still leaves me short on elevation with the NightForce 12-42X scope which has about 40 MOA elevation. When I build a rifle, truing and timing the action is a standard procedure, and Gerry’s gun was no different. Most shooters understand the concept of truing, but are confused about what “timing” is. When an action is out of time, it is typical that the bolt operation is stiff, bolting or unbolting. This is caused by several things, such as the cocking ratio being out of balance, and the sear engaging too early or too late. Another geometry problem is that the lead-in ramps and the primary extraction are not synchronized, but are actually in conflict with one another. When we true an action, it consists of much more than just machining a few mating surfaces. First the lead-in angles (the ramps that lead into the lug seats) are re-cut to a true helical cam. The factory cuts are made with an end-mill, and are not helical. A helical cam is like a spiral staircase, and I have developed special tooling to precisely cut the lead-in angles to engage the whole width of the bolt lugs. The receiver face and the lug seats are machined to square them up relative to the receiver threads, not to the bore of the receiver like most gunsmiths would do using conventional wisdom. The reason for this is the barrel will be square to the bolt face. Concentricity behind the bolt head is not critical, as the “float” in the bolt head will allow the bolt body to be off center as much as .045″ in any direction, and still get full lug contact, although I’ve never seen one that bad. The bolt head is squared, front and back and the firing pin protrusion is reset to .040″ +- .005″. After this is done, the firing pin travel is corrected and timed with the sear and trigger. At this time the cocking ratio is corrected to avoid over cocking and hard bolt lift. The cocking ramps are reground to the correct angle, and lastly the barrel nut is faced for 100% contact. Many gun builders will re-barrel a Savage without the barrel lock nut, by milling a shoulder on the barrel and mounting the barrel Remington-style. The only advantage to this is that it will let you fit a heavy-contour barrel with a diameter that is larger than the nut. The nut has several advantages, however. 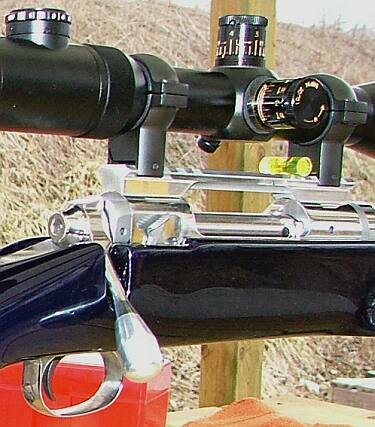 First the nut makes it much easier for the gun’s owner to set headspace and switch barrels. Second, the barrel lock-nut provides a more solid thread joint and controls harmonics in a positive manner. I truly believe the barrel nut can enhance accuracy. In fact, I’ve made Remingtons shoot better by simply cutting back the shoulder and adding a nut. The biggest share of the Savage rifles I build are varmint rifles, and the owners usually request a dull matte finish for less glare in the field. However when Gerry Nordmann requested a high polish on his project, I was eager to see a Savage that would rival a Stolle Panda. This task was not as difficult as one might think–I have a polishing machine specifically built for polishing barrels and other cylindrical parts, so very little hand work was needed. The polished action is a real eye-catcher, that’s for sure. Editor’s Note: Fred Moreo has long been the “great innovator” in Savage gunsmithing and accurizing. He’s invented most of the Savage upgrades that have become so popular. Long before Savage introduced its Accu-trigger, Fred had designed and marketed a true match-grade aftermarket unit. Same thing with upgraded recoil lugs and over-size “tactical” style bolt handles. His company, Sharp Shooter Supply, also offers reasonably priced, high-quality “drop-in” Savage stocks and pre-chambered barrels. If you need a new bolt head, recoil lug, barrel nut wrench, or stock for your Savage, Fred is the man to call. You’ll also find his shop rates are very reasonable. All content Copyright © 2010, 6mmBR.com | AccurateShooer.com, All Rights Reserved. Topics: 6mm, 6mm BR, 6BR, Norma, 6.5mm, 6.5-284, Savage, Accutrigger, SharpShooter Supply, SSS, Fred Moreo, 1000, 1000-yard, Iowa, Redding, Forster Ultra, Wilson, Micrometer, K&M, Arbor Press, 105, varmint, silhouette, 600 yards, F-Class, Benchrest, BR, Bench Rest, Single-shot, competition, rifle accuracy, Norma, 203B, Hodgdon Powder, H4895, IMR, IMR 4895, Varget, Vihtavuori, Berger Bullets, Sierra, Clinch River, Lapua Scenar, Sierra, MatchKing, Competition Shooting, stocks, stainless barrel, reloading, powder, case forming, neck-turning, Lapua Brass, Scenar, bullets, precision, RCBS, Chargemaster.